I took advantage of yesterday's warm weather and lack of rain to bring in the rest of the produce from the summer garden. I couldn't believe we got over two pounds of green beans this week, in the last week of October. 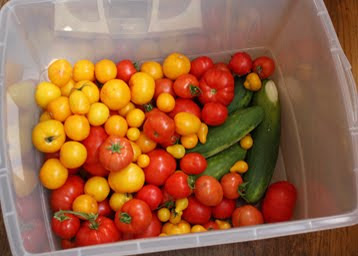 And tons of tomatoes, too, including all of the green ones to store up in the cool basement. I'm going to do like I did last year and wrap them individually in newspaper. That gave us tomatoes through December and part of January last year, ripened a few at a time. This week's haul alone was 22.5 pounds of produce. I think I've been averaging at least that for most of the summer. I meant to diligently weigh all of the veggies we brought in from the garden this year and get a good idea of how much we were growing, but of course most of the time we just go out and pluck some lettuce or a cucumber or the kids go grab some snap peas and it never gets weighed. The yellow Taxi heirloom tomatoes were not a very good producer. They were supposed to be large, but ended up much smaller than the red ones, they split easily in the moister fall air, and produced about half as many as my romas and bigger red tomatoes. I planted two types of green beans, Blue Lakes and Kentucky Wonders. One of them produced nice thin green beans that the kids like to eat, and the other had pods that quickly got fat and woody and not very edible. But I didn't write down which variety I planted where! So now I don't know which ones to order for next year. Anyone knowledgeable about green beans can help me out on this one? Planting the peppers much earlier (March instead of May) produced a much bigger crop, even though it took them a long time to get going. You can only eat so many cherry-size tomatoes. Next year I'll only plant one or two instead of three or four bushes! Now it's on to the fall garden, I've got loads of kale and chard still going strong. Yum! I've found myself frustrated this year with the kids' activity schedule and locations. It seems like everything has conspired to keep us from being able to bike to anything. Many of the locations we have to go to are either on the far fringes of town (7 - 10 miles from our house) and/or on the opposite side of town from the next activity that we need to get to. I can't help thinking how in the future fuel prices may affect businesses that choose to locate on the outskirts of town, forcing them to reconsider closer-in locations. I'm sure it's economically more feasible right now for them to rent or buy on the fringes, but as more of their customers simply can't make the drive, perhaps that will change. One bright note is that our karate dojo, where we spend an awful lot of time these days, will be getting a direct bus route. They're building a big bus stop for the "EMX" (express) bus right in front of the dojo. That's good news because since they relocated last year they moved from a 3.5 mile easy bicycling trip for us to get to the dojo to an 11 mile difficult and much more hazardous ride. As the kids get older, the old location would've been something they could've biked to themselves, largely on bike-friendly streets and bike paths. The new location involves riding through some of the most bike-unfriendly streets in our area. Sadly, though they put in a beautiful new bike bridge crossing the interstate (making the bike commute easier and safer), they chose to end the path in the back of a big shopping mall, along streets with tons of people zipping in and out of parking lots. So although we could get most of the way there on bikes, the last mile would be something I wouldn't want the kids to be navigating on bikes (the last time I rode down that road on my own bike, I was almost struck twice). So the bus will be a good alternative once the line is completed. I do worry though because so much of our bus funding is tied to gas taxes. While that sounds like a terrific way to fund public transport, the reality is that when gas prices go up and people can afford to drive less (and some people can't afford to drive at all), the funding for public transportation takes a dramatic nosedive. The last time gas hit $4 a gallon here, they started cutting bus routes! Clearly, we need a different approach to funding public transport so that as we begin our transition from a 1-car-per-person approach to a conservation-minded approach, people have options.  One of these photos is a cyclist (me) with an adequate light for night riding. The other photo is approximately what the cyclist looked like that I almost ran into on my bike last night. Sheesh people, I'm all for cycling but buy a light for heck's sake! I mean, these days you can buy a $1 LED keychain light that's brighter than my first cycling lights and duct-tape it to your handlebars! 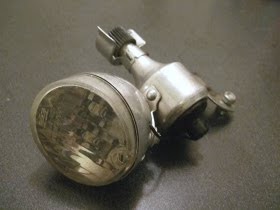 When I started out commuting by bike (in college), I had an old-fashioned dynamo generator light on my sweet red single-speed Schwinn 40 pound fat-tired cruiser (can you tell I wish I'd never sold that bike??). The light caused a heck of a lot of friction while engaged, and put out a fairly feeble amount of light, but that was more or less what was available in those good ol' days. Next, I moved on up while bike commuting to Microsoft. 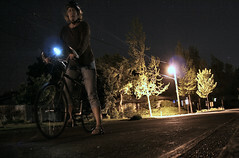 Since part of my 22 mile RT commute was on an unlighted powerline trail, I needed an optimum bike and lighting system. 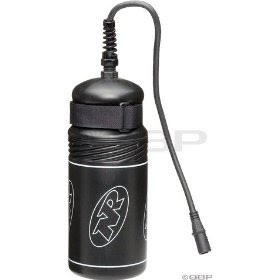 I upgraded my ride to a Specialized Rockhopper and my light to one of the new Niteriders, which came with this heavy duty battery that fit in your water bottle cage. It was cumbersome and I had to haul it in from the garage to plug it in every night, but it put out some good wattage and stood up to Seattle's rainy climate for years. Now of course with the miracle that LEDS bring to our lives (let's all take a moment and truly appreciate the genius that is an LED folks), my bike light takes two rechargeable double-A batteries that last FOREVER. I can't remember the last time I had to recharge them, come to think of it. It fits in the palm of my hand, weighs a few ounces, and puts out a great beam (see photo above). The blinky on the back, also armed with LEDS and rechargeable batteries can probably be seen by sattelites orbiting the earth. All of this to say, if you're out there and you're riding without a light, you're endangering yourself and everyone around you, and there really is NO EXCUSE. No cumbersome dynamo, no expensive gadget-laden professional lighting system, all you need is an el-cheapo LED and BINGO you're visible! 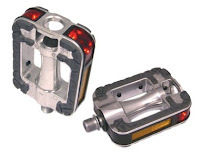 Myself, being the bike geek that I am, I really want some of THESE. They have internal micro-generators so they don't need any batteries and recharge themselves fully after 30 seconds of pedaling. Made by DOSUN, I'm eagerly awaiting seeing them in stores. One thing my son inherited from me is a distaste for the feel of unfinished wood. I don't know how to explain it, other than that feeling unfinished wood gives me that fingernails-on-chalkboard feeling. I remember as a kid that one thing I hated about cooking was touching the wooden spoons or the cutting boards. Fortunately, they know make plastic stirring spoons and cutting boards. However, when it comes to clothespins, plastic is vastly inferior as we discovered. I've been looking for a clothespin that isn't rough wood but the plastic ones just don't seem to grip well, plus after one season of being out in the sun they are cracking and falling apart. Bamboo clothespins to the rescue! Whitney Designs makes a nice bamboo clothespin that's exactly the same size and gripping strength as our regular wood clothespins. Better yet, they're environmentally friendly and smooth to the touch. There's probably a nationwide trend right now among the farming/urban gardening blogs - a trend of silence. Maybe other folks can keep up with the harvest and blog about it too, but I always find this time of year a little bit overwhelming. It makes you realize why harvest festivals like Halloween were such a big celebration over the centuries. When you're done getting in the fall veggies and all of the fruit is preserved and the apples and potatoes packed away in the root cellar, well I imagine that would be when you'd be ready to have a really big party and just relax! I've got at least 5 more days of good weather, and I'm going to try to make the best out of this fall harvest season while I can.